ATLANTA, Georgia (CNN) -- State and federal investigators said Tuesday that they spent the past two days gathering evidence in the last documented mass lynching in the United States: a grisly slaying of four people that has remained unsolved for more than six decades. 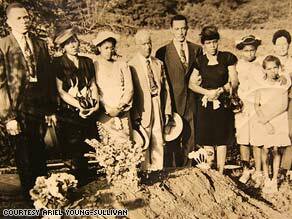 Relatives of the Malcoms and Dorseys stand at their loved ones' fresh graves in this 1946 photo. In a written statement, the FBI and the Georgia Bureau of Investigation said they collected several items on a property in rural Walton County, Georgia, that were taken in for further investigation. On July 25, 1946, two black sharecropper couples were shot hundreds of times and the unborn baby of one of the women cut out with a knife at the Moore's Ford Bridge. One of the men had been accused of stabbing a white man 11 days earlier and was bailed out of jail by a former Ku Klux Klan member and known bootlegger who drove him, his wife, her brother and his wife to the bridge. The FBI statement said investigators were following up on information recently received in the case, one of several the agency has revived in an effort to close decades-old cases from the civil rights era and before. "The FBI and GBI had gotten some information that we couldn't ignore with respect to this case," GBI spokesman John Bankhead said. Georgia state Rep. Tyrone Brooks, a longtime advocate for prosecution in the Moore's Ford case, called news of the search encouraging. "We just hope and pray they can bring some of these suspects to the bar of justice before they die, because they're all getting up in age," said Brooks, the president of the Georgia Association of Black Elected Officials. Investigations like the one into the Georgia slayings may have gotten another boost in the past week. A U.S. senator agreed to unlock a bill that would create a "cold case unit" at the U.S. Justice Department. The legislation is sponsored by Democratic U.S. Rep. John Lewis of Georgia and passed 422-2 in the House. But Sen. Tom Coburn, R-Oklahoma, used an obscure Senate rule to freeze the bill, just as he routinely does on efforts that require government spending. The plan would authorize $10 million a year for the next 10 years for the Justice Department to create a unit prosecuting pre-1970 civil rights cases. Another $3.5 million would go annually toward the department's cooperative efforts with local law enforcement. But last week, a spokesman said Coburn would lift the hold in exchange for a vote on cutting Justice Department spending in other areas. Law enforcement officials say they face a daunting task prosecuting the deaths of Roger and Dorothy Malcom and George and May Murray-Dorsey. Many of the dozen or so men who opened fire on the couples with shotguns, rifles and a machine gun are now dead, they say. And in the days following the massacre, residents of the community about 40 miles east of Atlanta, Georgia, were tight-lipped with federal agents sent by President Truman to investigate. But advocates like Brooks say they think there was enough evidence in FBI files at the time to bring a case against the suspects. He said his group has identified five suspects in the slayings who are still alive. Morgan County chief sheriff's Deputy Bruce Wright said the 12-acre area searched Monday and Tuesday may have once been a working farm. The written statement said the current residents of the area are not suspects. Bankhead and Wright said a bomb squad was called in to detonate some old military-style ordnance found on the property, but those explosives were not thought to be relevant to the Moore's Ford case. The lynchings were officially re-opened for investigation by former Georgia Gov. Roy Barnes nearly eight years ago and were on a list of revived cold cases cited by former U.S. Attorney General Alberto Gonzales early last year. Brooks said he and other advocates have noticed renewed activity by investigators in the area since then. "We can feel their presence when we're there," he said. "Every time we do something, people show up that we've never seen before, and we know they're not regular folks who live in Walton County. We don't get in their way, and we don't ask many questions." Historians say there has never again been a documented case of as many people being lynched -- killed by mob without due process -- in one attack in the United States since Moore's Ford.